In 2011 Shawn Dollar won the XXL award for “Biggest Paddle” after surfing a 55 foot wave at Mavericks. The next year he beat his own record, paddling into a 62 foot wave at Cortes Bank, earning himself not only the XXL Award for Biggest Paddle, but also the award for Biggest Wave. During those years, Dollar wasn’t even a professional surfer. He was working in the surf industry, and had been for ten years, as well as being a broker for Dollar Brokerage, handling 160 accounts. He became a Reef sales rep in 2010, in the midst of his rise to big wave stardom. Whilst 10 years of surfing Mavericks had taken its toll on Dollar, who had suffered a series of injuries and concussions over the period, it was an accident last year which really changed his life. 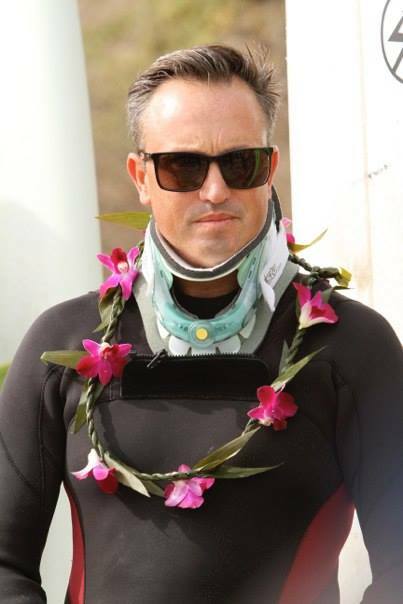 After getting caught inside on a big set at an undisclosed spot off the coast of California, Shawn dived under a line of white water and smashed into a pinnacle of rock sticking up, shattering his neck in four places and suffering a dramatic brain injury. Despite his life-threatening injuries and the remoteness of the location, Dollar managed to make his way back to shore. What followed was the most difficult year in his life, as he struggled with the physical and mental aftermath of his injury. In a brand new podcast he sits down with pro surfer and renowned podcaster Kyle Thierman to tell his fascinating and inspiring story in its candid entirety. If you don’t have time to listen now, we recommend downloading it here, as it’s well worth an hour of your life.